The View control defines a rectangular area on the screen and the interfaces for managing the content in that area. Now we will discuss in detail related to properties and actions of the view. Tapping on any view will open the following window as shown below. 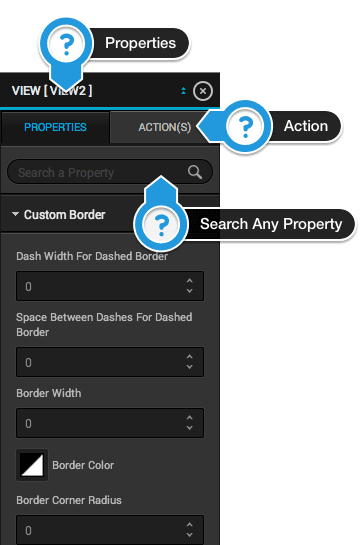 In properties tab you can change any property of view and even can easily search using the search bar. Xpos : To change X position of the view with respect to the superview. Value - float : Values can vary from -37282702 to 37282702 (width of iPhone screen). Ypos : To change Y position of the view with respect to the superview. Width : To change width of the view. Height : To change height of the view. Object ID : Set the unique ID of the object in the current selected screen to make use of this for future purpose. Value - String : Select any value from the drop down list. Key Name to Data : To display data coming from server. Object Parent ID : Clicking on this will open the drop down list of all the views inside the Main_View which are on child level 1. Hide : To hide/Unhide the view in the current selected screen. Value - Bool : Enable this to hide the selected view. To change the autoresizing mask of the view as per the superview. Clicking on this button will open the following window as show below. Allows expanding or shrinking a view in the direction from the top margin. Allows expanding or shrinking a view in the direction from the left margin. Allows expanding or shrinking a view in the direction from the bottom margin. Allows expanding or shrinking a view in the direction from the right margin. Allows expanding or shrinking a view’s width. Allows expanding or shrinking a view’s height. As per the selection of NSV flags the reflection will be displayed in the square area. Tap on save to save the settings. Clip Subviews : A Boolean value that determines whether subviews are confined to the bounds of the view. Value - Bool : Enable this to clip the subviews of the current selected. To change the background color of the view. Clicking on the box will open the picker as shown below. User Interaction : A Boolean value that determines whether user events are ignored and removed from the event queue. Value - Bool : When set to NO, user events—such as touch and keyboard for the view are ignored. When set to YES events are received normally by the view. The default value of this property is YES. Alpha : The view’s alpha value. Value - float : The value of this property is a floating-point number in the range 0.0 to 1.0, where 0.0 represents totally transparent and 1.0 represents totally opaque. This value affects only the current view and does not affect any of its embedded subviews. Border Width : To change the width of the border of the selected view. Value - float : When this value is greater than 0.0, the tool will draw the border around the view. The default value of this property is 0.0. Border Color : To change the border color of the view. Clicking on the box will open the picker as shown above. Border Corner Radius : The radius to use when drawing rounded corners for the view’s background. Dashed Width For Dashed Border : To change the width of the dash which is bordered around the view. Value - float : When this value is greater than 0.0, the tool will draw the dashed border around the view. The default value of this property is 0.0. Space between dashes for dashed border : To change space width between the dashes on the border of your view. Value - float : When this value is greater than 0.0, the tool will show dashed border around the view. The default value of this property is 0.0. Has Navigation Detail : A boolean value to determine whether there is any navigation from current screen to any other screen.The main purpose of this property is to transfer data from current screen to next screen. Scrolling View Id for vertical Navigation : Set View ID of the view that you want to scroll in the current selected view. This current view will act as template for the other views that will be displayed in the center of the current selected view. Value : Select any object ID of the control in the current selected view from the drop down list. Header View ID : Set View ID of the view that you want to scroll in the current selected view. This current view will act as template for the other views that will be displayed in the header of the current selected view. Footer View ID : Set View ID of the view that you want to scroll in the current selected view. This current view will act as template for the other views that will be displayed in the footer of the current selected view. Header Animating Image Identifier : Set View ID of the view that will animate when user will scroll up in the current selected view. This current view will act as pull to refresh view. Value : Select any object ID of the imageview in the current selected view from the drop down list. Footer Animating Image Identifier : Set View ID of the view that will animate when user will scroll down in the current selected view. This current view will act as pull to refresh view. Enable Vertical Scrolling : A boolean value to enable the view work as a vertical scrollview. Value : The default value is NO. Transform Angle : Angle to rotate the object when it is loaded in the current screen. Value : The default value is 0.0. Tapping on action tab will open the window as shown above. Double tap on any action in the above screen will open following window as shown below. 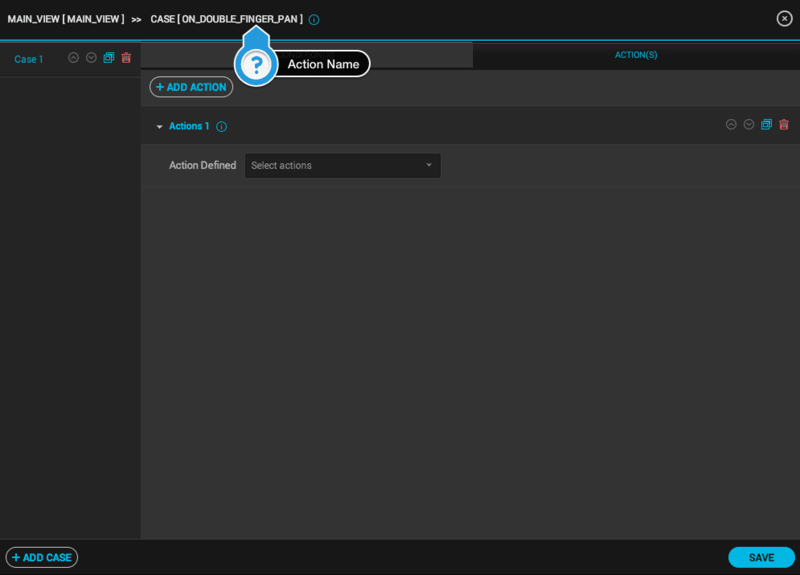 You can configure action for any event in this window. Action related to the event will be called off when that events occurs by user interaction or by system interaction. As shown in figure in this window you can add different cases and depending on the case you will add as many actions as many you want. We will be discussing later about the configuration of the cases and adding actions. 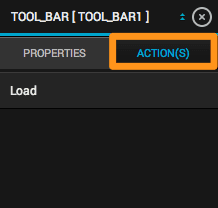 Lets discuss about the events that we can configure in actions tab. On Double Finger Pan : The action related to this event will be called when user pan on the screen with two fingers. On Single Finger Swipe : The action related to this event will be called when user swipe on the screen with single finger. Double Finger Triple Tap : The action related to this event will be called when user triple taps on the screen with two fingers. Double Finger Double Tap : The action related to this event will be called when user double taps on the screen with two fingers. 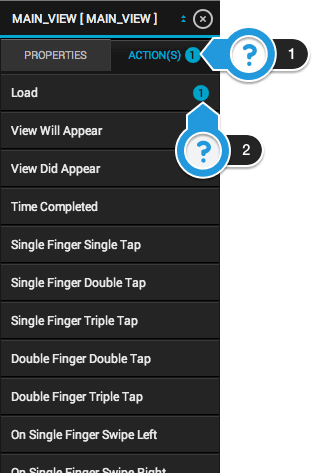 On Double Finger Swipe Up : The action related to this event will be called when user swipe on the screen with two fingers. On Single Finger Swipe Up : The action related to this event will be called when user swipe up on the screen with one finger. Load : The action related to this event will be called when system loads the screen. On Double Finger Swipe Right : The action related to this event will be called when user swipe right on the screen with two fingers. Double Finger Single Tap : The action related to this event will be called when user single tap on the screen with two fingers. Single Finger Triple Tap : The action related to this event will be called when user single tap on the screen with single finger. On Double Finger Swipe Left : The action related to this event will be called when user swipe left on the screen with two fingers. On Single Finger Swipe Down : The action related to this event will be called when user swipe down on the screen with one finger. Single Finger Double Tap : The action related to this event will be called when user double taps on the screen with single finger. Single Finger Single Tap : The action related to this event will be called when user single tap on the screen with single finger. On Single Finger Long Press : The action related to this event will be called when user single long press on the screen with single finger. On Double Finger Long Press : The action related to this event will be called when user single long press on the screen with two fingers. On Single Finger Swipe Right : The action related to this event will be called when user swipe right on the screen with single finger. Animation Completed : The action related to this event will be called when animation gets completed which is configured in the add action window. An image view object provides a view-based container for displaying a single image. Below properties are explained in detail in View Control. Please refer above. Choose the image from the resources to display image in the imageview. Tapping on will open up the image as shown below. Choose any image from the list and tap on save to apply image to the imageview object. Choose upload and then tap on save to save apply image to the imageview object and save in the resources. Highlighted Image : The highlighted image displayed in the image view. Value : Choose the image from the resources to display image in the imageview. Tapping on will open up the image as shown above. Highlighted : A Boolean value that determines whether the image is highlighted. Value - bool : This property determines whether the regular or highlighted images are used. When highlighted is set to YES, imageview will use the highlighted Image property. If both of those properties are set to nil or if highlighted is set to NO, it will use the image. Value : Click on the drop down list and choose any value from the list. Placeholder Image : To display image while the original image is getting downloaded from the server. Value - Image : Choose the image from the resources to display image in the imageview. Tapping on will open up the image as shown above. Enable Image Detailing : To allow user to view image in full screen, when user will tap on the imageview. Value - Bool : Enabling this property will allow user to view image in full screen as well as user can zoom in and out the image. Key Name To Detailing : To display higher resolution or different image when user will tap on the imageview. Value - Bool : Clicking on this property ‘s drop down list will give you option to select the web service key of the web service that you have successfully configured in the Data Source panel. Below property are explained in detail in View Control. Please refer above. As shown in above figure the Image View's actions are almost similar to View ‘s actions which are discussed above. Please refer description of all the actions of ImageView as given above. Use the WebView control to embed web content in your application. Detection : The types of data converted to clickable URLs in the web view. Value : You can use this property to specify the types of data (phone numbers, http links, and so on) that should be automatically converted to clickable URLs in the webview. When clicked, the text view opens the application responsible for handling the URL type and passes it the URL. Opaque : A Boolean value that determines whether the view is opaque. Value - bool : This property provides a hint to the drawing system as to how it should treat the view. If set to YES, the drawing system treats the view as fully opaque, which allows the drawing system to optimize some drawing operations and improve performance. If set to NO, the drawing system composites the view normally with other content. The default value of this property is YES. Scales page to fit : A Boolean value determining whether the webpage scales to fit the view and the user can change the scale. Value - bool : If YES, the webpage is scaled to fit and the user can zoom in and zoom out. If NO, user zooming is disabled. The default value is NO. Should Open Link : To open any link embedded in the html content in the webview. Value - bool : If YES, the webview will open any link in the safari app . If NO, the webview will redirect internally to the link. There are no actions related to this control. The AdView control provides a view that displays banner advertisements to the user. When the user taps a banner view, the view triggers an action programmed into the advertisement. For example, an advertisement might show a movie, present a modal advertisement, or launch Safari to show a webpage. Your application is notified when an action starts and stops, but does not otherwise interact with the advertisement. You receive revenue when users see new advertisements or trigger their actions. The property is explained in detail in View Control. Please refer above. Ad Type : To choose the type of Ad that you want to show in the view. iAD : You don’t have to do anything with iAD. Google AdMob : You have to provide Api key in the Third Party Configuration in the right panel. For Api Key you need to follow this Link. 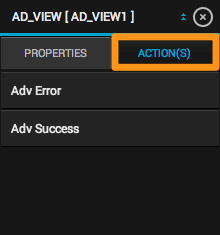 Adv Success : The action related to this event will be called when ad view starts successfully receiving ads. Adv Error : The action related to this event will be called when ad view fails receiving ads. The Navigation Bar is a kind of bar, typically displayed at the top of the screen, containing buttons for navigating within a hierarchy of screens. The primary properties are a left (back) button, a center title, and an optional right button. You can use a navigation bar as a standalone object. Below property are explained in detail in ImageView Control. Please refer above. Use an activity indicator to show that a task is in progress. An activity indicator appears as a “gear” that is either spinning or stopped. Large White : The large white style of indicator. White : The standard white style of indicator (the default). Gray : The standard gray style of indicator. 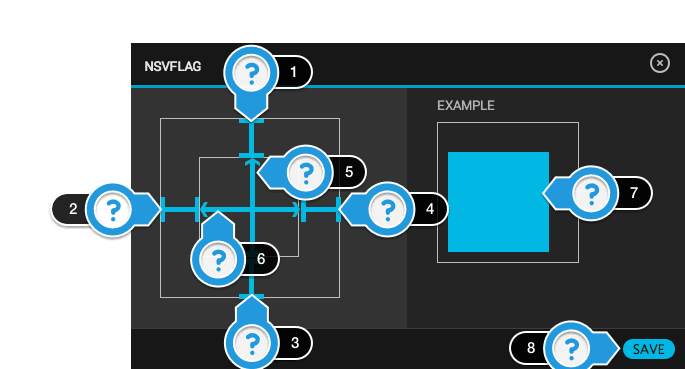 If the value of this property is YES (the default), the superview sets its hidden property to YES when receiver is not animating. If the hidesWhenStopped property is NO, the receiver is not hidden when animation stops. You stop an animating progress indicator with the stopAnimating method. If you set a color for an activity indicator, it overrides the color provided by the activityIndicatorViewStyle property. To change the background color of the toolbar. 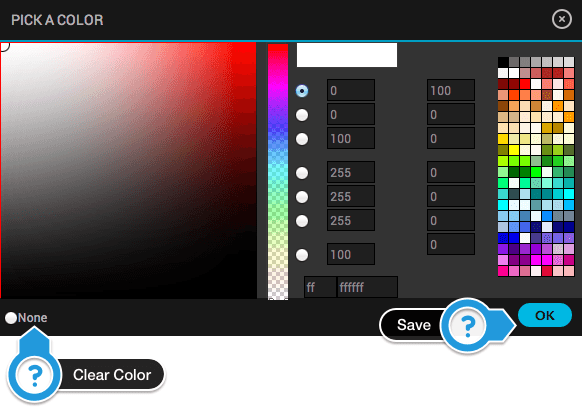 Clicking on the box will open the color picker . Background Image : Sets the image to use for the background in toolbar. As shown in above figure the Toolbar’s action is almost similar to View ‘s action which is discussed above. Please refer description of action of Toolbar as given above.